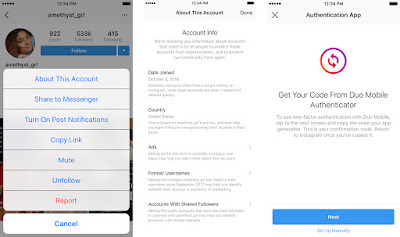 "About This Account" will show details for users with large follower counts, including when they signed up, where their activity is located, the ads they're running and their social connections. You can figure out whether that politician's account is a Russian ploy, or whether your celebrity crush really followed you. Instagram has been susceptible to Russia-linked election interference campaigns much like Facebook, and it's no secret that scammers have been masquerading as superstars for a while. Instagram is no stranger to fake accounts, and it's taking extra steps to ensure that you're not following fraudsters. It's rolling out an "About This Account" feature in the next few weeks that will show you details for users with large follower counts, including when they signed up, where their activity is located, the ads they're running and their social connections. You can figure out whether that politician's account is just a Russian ploy, or whether your celebrity crush really followed you. You won't necessarily have to dig that deep, either. Instagram has widened access to verification for "notable" public figures, brands and organizations. You can now apply for that coveted blue badge by submitting a form through the app, complete with a place to submit photo ID as proof. This potentially increases the number of verified users and should reduce the chances you'll follow a fake account. And yes, there is a security upgrade coming for everyone. 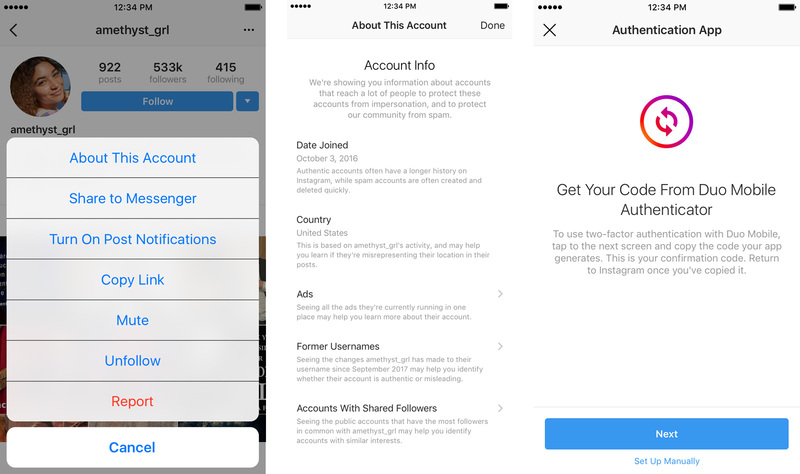 Instagram's two-factor authentication will soon support third-party authentication apps like Duo Mobile and Google Authenticator instead of old-fashioned text messages. While it's a modest addition, it could protect your account in case someone hijacks your phone number. It'll be widely available in the "coming weeks." In some ways, these improvements were overdue. Instagram has been susceptible to Russia-linked election interference campaigns much like Facebook, and it's no secret that scammers have been masquerading as superstars for a while. As imperfect as these solutions may be ("About This Account" requires that you already be suspicious), they could ward off deceiftul types who would have previously gone undetected.